Carded action figures samples were usually made by hand prior to production, in order that the folks at Kenner could get an idea of how the product would look in its packaging. They were typically made by attaching an example of the figure to a proof card using a prototype bubble. The bubble of the example you see here was affixed with double-sided tape. The blister card is identifiable as a proof by its corners, which are squared rather than rounded. 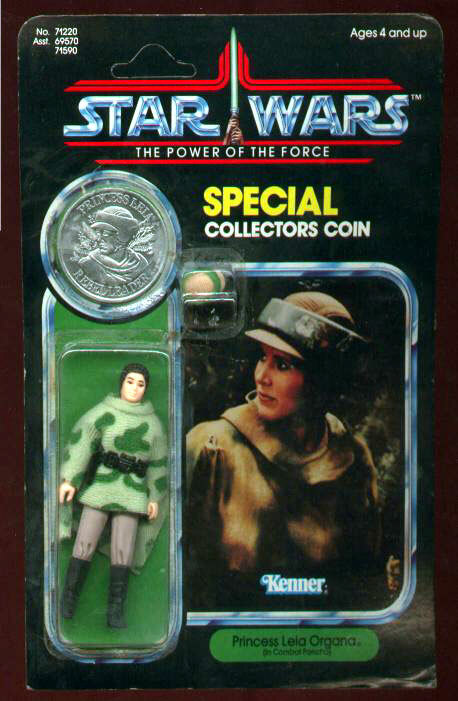 But also notice the bubble; it's form is much different from that found on the production Leia Poncho. Specifically, the area holding the helmet accessory is positioned differently, and the coin is contained by a bubble compartment that is entirely separate from the larger figure compartment.